In our litigious world where victimhood seems to predominate as an attitude and people have to find someone to blame whenever anything goes wrong or perceived injury is experienced, or people sit in self-pity whenever they have circumstances that they see as limiting them or “disabling” them, here are some real human beings who had the courage, will, gumption, or whatever we want to call it, to transcend their circumstances and build satisfying lives, even make a real difference in the world. You can find each of these, and many more, by searching online. Helen Keller. Remember her? Born blind, deaf, and mute, she lived in a world of silence and darkness, unable to communicate in or out. In childhood she was angry and bitter, her restless human spirit locked away, until someone (Annie Sullivan—check out the book, movie and play “The Miracle Worker”) exercised the patience and compassion to find a way to reach through these apparent “disabilities” and release the magnificent Helen Keller within. Helen Keller was never without these “disabilities” but went on to become an inspiration for uncountable other human beings that meaningful life is not defined by so-called “physical” abilities. Her remains rest in the lower level of the National Cathedral in Washington, D.C. You can visit the spot! Stephen Hawking. Born with an amazing mental ability, he was diagnosed in his twenties with amyotrophic lateral sclerosis (ALS), often referred to as Lou Gehrig’s Disease, and given only a short time to live. Now in his 70’s, having lost virtually all use of any of his muscles, he sits virtually motionless confined to a wheel chair. YET he has way outlived the prognostications, built an amazing career as an astrophysicist, occupies the Cambridge University Chair once held by Issac Newton, goes to his office every day, still lectures not only to his students but to worldwide audiences, is personally acquainted with many of the luminaries of the world, has been married and has children, has contributed deep understanding of the mysteries of the universe, and . . . A long time ago, he addressed his circumstances, and decided he was not a victim. He decided they were just the hand of cards he was dealt in the game of life and he would play it as a winning hand! He has a sense of humor and does not sit in his chair in self-pity. Rather uses his amazing mind to not only contribute to science, but also keep ahead of his muscle loss and maintain communication of his ideas to us, the rest of the world. When I look at Stephen Hawking, I do not see a man with disabilities. I see a man of amazing human ability! I have all my physical and mental faculties, yet I ask myself what have I done of note that would gain me such a worldwide reputation and admiration? Who is disabled? Stephen Hawking, or me? Viktor Frankl. He was a Jewish psychiatrist in Austria who got caught up in the Nazi death camp system and was sent in a cattle car to Auschwitz. He survived to write an amazing book about his experiences there and what he learned about life entitled Man’s Search for Meaning. It is available in paperback at most bookstores. Its descriptions of his experiences at Auschwitz are not pleasant reading, but in writing about what he learned, he models the magnificent human capability to transcend circumstances. In Auschwitz, he discovered there was a place within him where he had choice! They could not take that away from him. They could not force him to hate them! eHeNo matter how hard they tried, they could not remove from him his humanity! He could choose his response, even to those unimaginable circumstances that surrounded him and to which he was continually subjected! I doubt that I or most of us here in these United States will ever experience anything resembling the horror he had to survive every day. If Viktor Frankl, just another human being like me, has that amazing place of inner choice where he could transcend even those horrible circumstances, surely I can handle mine and we can handle ours! I was recently invited to meet with a sixth grade class at a local school and talk about my book, I’m OK! 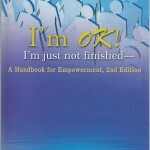 I’m just not finished—A Handbook for Empowerment, Second Edition. The teacher alerted me that they were having problems with bullying there. When I was a kid, bullies attacked others physically, often recruiting others to participate in beatings. Now they attack emotionally, online, alone, anonymously, and recruit their cohorts anonymously. Mob mentality gathers the crowd. Bullies do not represent superiority. They represent cowardice and low self-esteem. They have to hide. They seem to come from the place of, since I feel like a piece of crap myself, if I can reduce someone else to my level or below, then maybe I can look downward and feel a bit of power or a shred of self-esteem. Empowerment is not achieved externally. It is completely an internal experience. With these amazing heroes to inspire us, I invite everyone to find that ability within, given to every human being with the package of our inherent humanity, to find our own magnificent ability to transcend circumstance, physical, mental, or social, and live that satisfying life of self-acceptance and self-esteem. I invite parents to find it within yourselves, practice it in your own lives, and teach it to your children. We have good examples and models to follow that demonstrate it is possible!